Ever since The Night Circus, in which I fell in love with the idea but not quite the execution, I’ve been looking for a good circus story. Daughter of the Burning City sounded like a promising candidate, but ultimately ended up like The Night Circus: I loved the premise, but not quite the execution. Page one, then chapter one, and you’re introduced to a dazzling world – it’s a little out there, a little different, a little fantastical. I loved the idea of the illusions, the traveling circus city, a girl who had no eyes but could see, someone without a heart but had blood running through their veins… But at the same time, you’re plunged headfirst into these huge, block-of-text-paragraphs that infodump most every detail about the characters and the setting. This carries on for a good quarter of the story before the info dumping starts to ease up. I loved how unique and different all of Sorina’s illusions were – each of them sounded so vibrant and distinct from the other (nails instead of hair, an illusion I couldn’t help but picture as Groot, and a fire-baby, among others) – but there’s got to be a better way to introduce them, as well as the rest of the traveling circus to us, than by slamming it all into our faces by means of hefty, telling monologue. The author has a dazzling imagination. 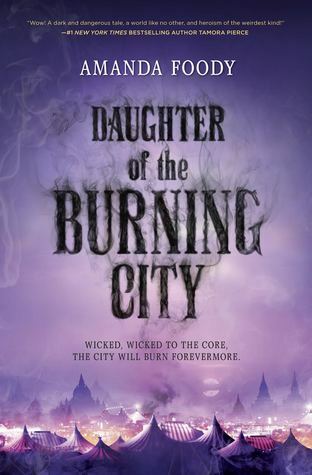 It practically bleeds through in Daughter of the Burning City, the world she created was interesting and magical, and I’d definitely be up for reading her next novel. But I feel like this novel definitely could’ve benefitted from adhering more to the old “show not tell” saying. And, whatever was up with Luca? There was all this awful stuff slung at him about his supposed sexuality, and, however the author had intended to portray Luca in the story, it came off as really was quite muddled. What the author explicitly said about Luca and what she actually wrote in for Luca seemed to contradict each other a lot of the time. I was pretty confused, and I’m really not quite sure how to feel about it all? he’s definitely favorite character material^^. And the mystery! I didn’t see that coming, but I should’ve. Daughter of the Burning City reads like a fantastical, slightly eerie murder mystery, which wasn’t quite what I was expecting when I started reading it, but I definitely didn’t dislike what I discovered it to be. I just have to add though that the development at the end killed any support I had for the romance in this story, though. Call me old-fashioned, call me a prude, call me close-minded, but nope – I can’t get behind this. I just. Can’t. I don’t see how both sides could actually freely give consent in a relationship like that? The main character, Sorina, was decent – she didn’t really stand out particularly in any way, but I liked her enough. I did really like and appreciate what the author did with addressing issues of self-esteem and diversity and the feeling of otherness through Sorina, though, as well as through some of the other supporting characters. The highlight of Daughter of the Burning City was definitely the side-characters and the setting. Though it didn’t quite do the trick for me, I can definitely see what all the buzz and talk about Daughter of the Burning City was for.